Woo! I've joined the land of 4K. I mean, I had 4K before, from my GoPro Hero 3 Black at 15fps and then my Samsung S5, but those are kind of like… gimmicky versions of 4K video resolution - lacking a full feature set, and without the kind of control a photographer likes to have with an image they are capturing. 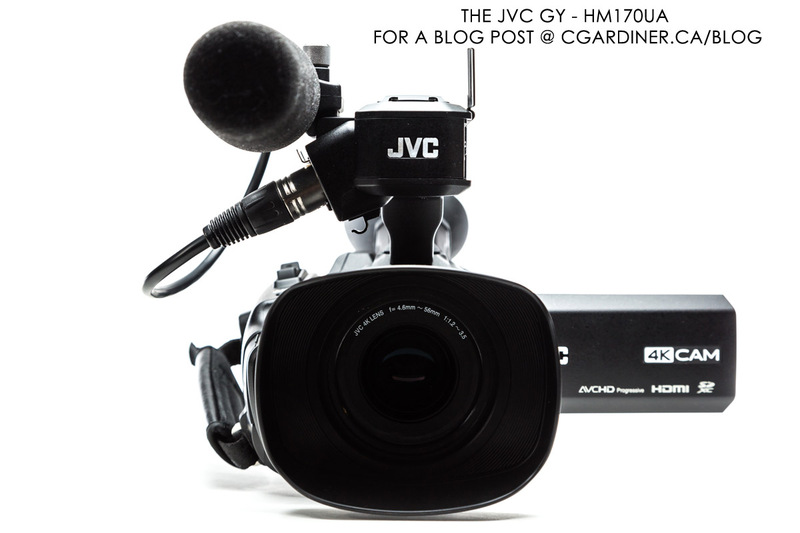 Very recently I decided to take the plunge into a truly 4K workflow and service offering by purchasing the JVC GY-HM170UA 4K digital camera. I know.. it's a mouthful, why can't the have easy names like Canon 6D or GoPro 3 Black. anyways… after a few weeks of using it, I thought I'd share some thoughts on the new feature loaded 4K camera. When I shop for a new camera, it usually takes me weeks, nope, months to decide on what to buy, this camera was no different. I was actually looking at new cameras that I would be treating as video specific since January of 2016, but then we found out about baby on the way, had to buy a house, renovate a bunch of it, get a new car, and all sorts of life things so the new video camera had to take it's place on the back burner. I was able to do little more than window-shop online and watch reviews, demos and test footage of all the cameras I was considering. Now, in November, comfortably settled into my new way of life - I was able to seriously consider a new video camera again. 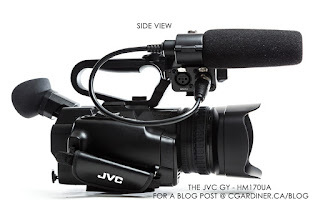 This was my thought process in sequence ; Panasonic GH4 > Canon C100 > Canon 5D mk4 > C100 > and finally arriving at the JVC HM170. The panasonic GH4 was a choice because it had 4k. It could be made to be compatible with my existing lenses by way of a metabones adapter to take EF lenses - not investing in a whole new line of lenses was a very important thing for me. The only problem was all the lenses on a MFT camera would have a very different crop factor and so I'd still need to buy some new lenses to get the range I'm used to. Then, even though the C100 didn't have 4K I became very close to 'pulling the trigger' on buying it. 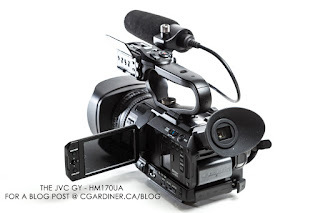 It was more video dedicated than the GH4, which was important. I wanted something that felt and operated like a video camera instead of a DSLR. The C100 would use my existing line of lenses, at their actual focal length. So that was huge. There was lots of complaints about the less-than-pro level of compression in the C100, but I was ready to shell out a few extra hundred dollars for an atomos recorder so I could do 4:2:2. Then they announced the 5D mk4 release which would be 4K capable, which is sweet, because it was only marginally more expensive than a C100, it did 4K, but then I found out about the crop factor for shooting in 4K was 2x or essentially the same as a GH4 with an MFT sensor. So I thought I'd save the extra cash and skip over the 5D mk4 thing since it wasn't exactly what I wanted. 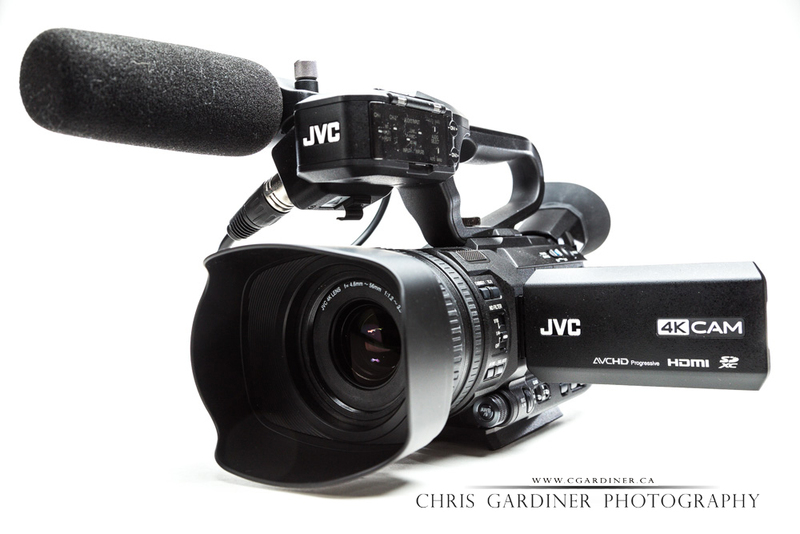 I was so close to buying the C100 with Dual Pixel Autofocus when I don't know how but I came across the JVC. It had the form factor and feature set of a dedicated video camera, it had 4K, it had 120fps FHD which wasn't really on the want-list but still pretty damn cool. The test footage and demos online looked pretty sweet, and at half the cost of any other camera I was seriously considering, it was a lot smarter given my current situation with the new baby, new house and new car, anything that sounds better to my wife also sounds better to me. haha. As far as cameras in this price point went, I tried a few other in the same week I decided to buy this one - that belonged to someone else I was working for - and that really helped me decide on this one. Such as the Sony AX33 - also 4K - was lacking a lot of the features that came with this one, and the features it did have were much harder to access when you were using it. Integrated image stabilization - which I haven't used yet. This is actually the lower end of JVC's 4K professional camera line, but the features it is missing compared to its bigger brother, the HM200, are really only focused on internet connectivity and live streaming ability which I don't feel like I am missing. The picture quality and function is almost exactly the same - as far as I know without having tested the HM200. variable aperture - so f/1.2 at full-wide, but as you zoom into a scene, that decreases to f/3.5. so if you're in a shot you need to zoom in through, you'll want to treat it like a f/3.5 iris instead of having the exposure change as you zoom through when shooting full manual. light construction. This can be a plus and a minus to the camera. I like things that feel heavier and less breakable even if it means a little extra energy expended to use them. This one feels rather delicate. Just something to keep in mind. LCD screen is relatively low resolution, so even though you're shooting in the screen will not resolve nearly as much information as you're going to be recording. Also, the LCD screen is fairly noisy. Every time you change recording formats, frame rates, or resolutions, the camera needs a 10 second power down and reset - which it does automatically - but it's not a quick switch like a DSLR going from RAW to JPEG. It doesn't have a huge amount of background bokeh unless you're focused near your minimum distance which can be good and bad for you depending on your style, situation and subject matter. I've had it for not even a month yet, so I am still feeling it out, but it was very intuitive to get going with it. Even things like programming the buttons and my menu favorites or shortcuts, customizing the gain control, AWB and zebras were quite easy to do. The batteries last quite a while which is great, and also the batteries for this camera are not insanely expensive. Depending on the camera, it is sometimes recommended to plug it directly into your computer to download files, but these work great by just reading off the memory card with a card reader. The lens has two programmable rings and then there is a smaller wheel dedicated to the iris, so I can have zoom, focus and iris all as their own separate ring and wheel at the same time which is great. I've not used it a whole lot outside yet, but even in a shady forest on a sunny day I could see it has quite a good dynamic range to work with. I think it is important to share with you what I plan to use it for so you can understand why I made these decisions and then compare them to your own needs. real estate videography - potentially if I get a wide angle filter for it. I need to do more tests before I decide to do this. I really wanted to share some test footage from the camera but I just don't have enough to make it worth your while to watch just yet, so you can rest assured that I'll be shooting with it and hopefully putting something together in a week or so. I have a December 31st wedding to capture so at the very least, I will have some real working experience with it by then and maybe a few clips to share. As always, thank you for visiting and for reading. I hope this has helped you make up your mind if you were considering the JVC GY - HM 170 UA camera, whether you've decided in favour or against it. Finally got to work on some example footage to share, here is a short edit showcasing some 4K footage from the camera.